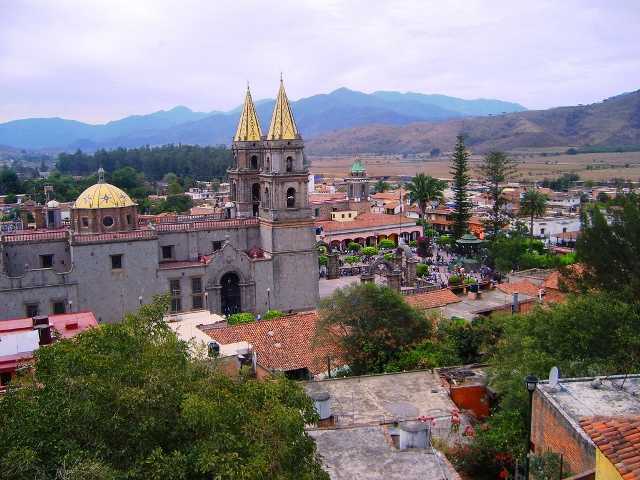 Talpa de Allende is most famous for it's pilgrimages to pay homage to the Virgin de Talpa. 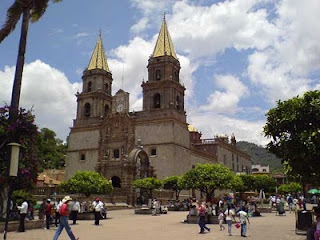 The icon is housed in Talpa’s basilica, built in her honor in 1782. 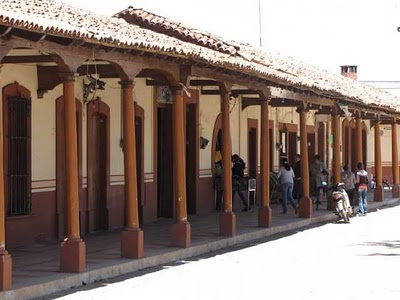 There is an old story that shortly after the virgin was found in the mid-1600's, she disappeared to Masota because the mayor of Mascota wanted the devoted coming to his town. Mysteriously the virgin kept returning to Talpa until the mayor finally gave up. The festivities begin every year on March 24th to commemorate the day the Virgin was unearthed. The fiesta continues for 3 months, till May. The route of the Pilgimage is from Ameca along highway 70 to Talpa. Talpa, a town of about 10,000 people will triple in size at times over the festival. 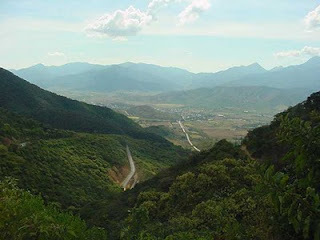 It's lcocated south of highway 70 between Ameca and Mascota in the state of Jalisco, Mexico. A friend told me about Concepción de Buenos Aires somewhere off the new road to Mazamitla as being an attractive place to visit. The turn off is about 10-12 miles up the hill from Amacueca to the right. Putting that name on a road sign is next to impossible so you'll see something like - Cocep de BA. 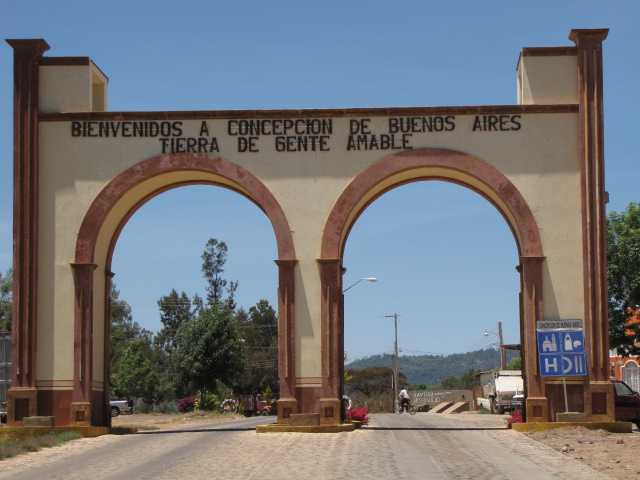 About 12-15 miles on this secondary road full of not very deep potholes appears the gates to Concepcion. 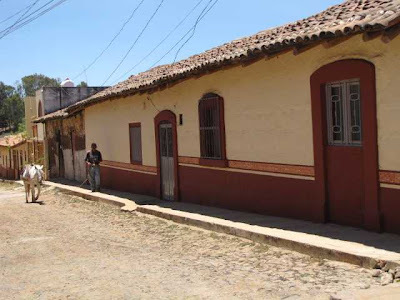 Without a map in this area it's hard to tell if you are in Jalisco or Michoacan. 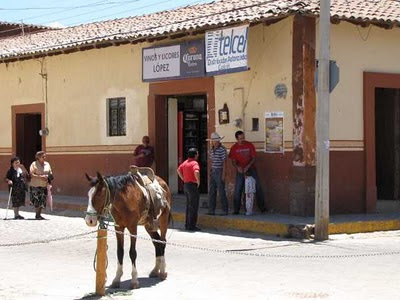 This is Jalisco! Marcos and I drove up to La Huerta on highway 80 only with the idea of looking around town and maybe taking a side road or two. What we found was some very helpful people in the Tourist Office (Oficina de Tourismo) just off the Plaza. 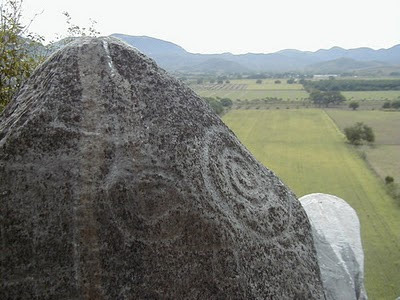 We knew about the Petroglyphs but had no idea where they were or how hard to get to. As we expected they suggested a guide, hiking boots and long pants (rock climbing and snakes) ... and we were in shorts and sandles. We asked what else might be interesting and the Balneario was suggested but maybe hard to find. It's on the same road as the Petroglyphs but further through lots of farm country. (Find the road just a little west of La Concha off highway 80) After a few wrong turns, meeting a few people and missing the second sign we found it. 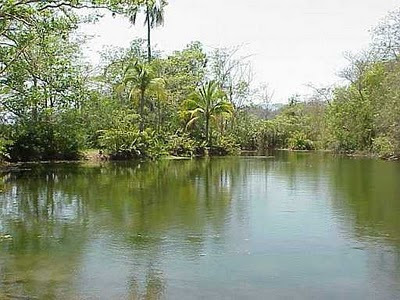 Actually a very pretty place somewhat like an oasis where the warm water originates from a spring. It's not well developed and like the tourist office called it, rustico. Swimming is not real safe except in the pool which was empty and I would be concerned about water quality. It was fun to find and see !! La Hacienda "La Ferrería" was founded in 1873 and as it's name says, it was a place of metal fabrication. They made train rails, ornamental iron, fountains and bronze church bells until around 1900. The dam was used to power the machinery. 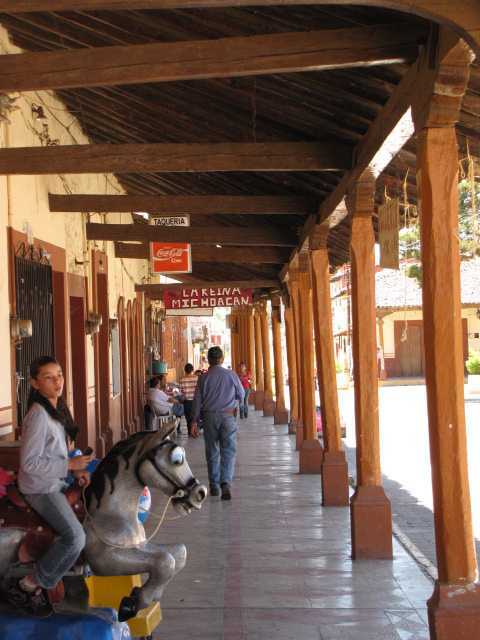 We stopped in Ferreria de Tula on the way to Tapalpa. 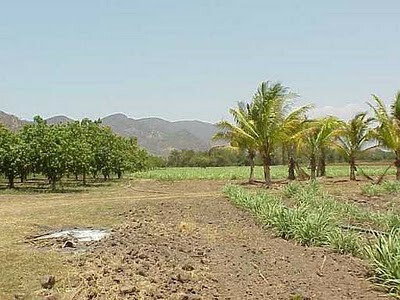 Now the town is agricultural and caters to Eco-Tourism with many country cabins. 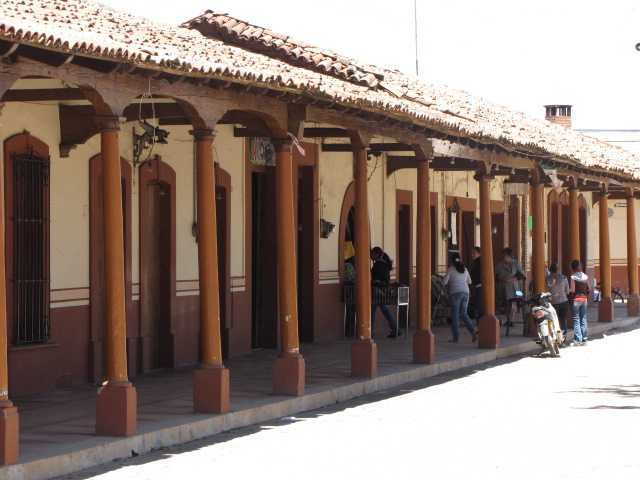 Back in November I was asked to go along on a shopping trip, found myself in downtown Chapala and remembered the Art Fair. Since I'd never been and Marilyn had - I opted to check it out while she continued her shopping. Very cool and worth the 50 peso admission. The paper art and weaving were my favorites and it was good to see the Cocucho potters making an appearance. Talk to the weavers and they'll tell you all about the extensive process of dying (like tie dying) and setting up the looms. A number of local artists made the fair as well like the muneca women from San Cristobal. Feria Exposición Maestros del Arte AC is a non-profit mexico art show held yearly in Chapala Jalisco, Mexico to promote the ever disappearing folk and indigenous art (artensania) of Mexico. Artists are invited from all corners of Mexico based on the quality of their work, whether their art has been passed down generation to generation, or perhaps they are an "undiscovered" artist who is worthy of recognition for his/her work. All art/handcrafts must be made totally handmade by the artist presenting their work and they must use only "natural" materials in its production.